1 x Wireless FM Transmitter in BLACK colour. iPhone (all incl iPhone 5). iPod (all). Galaxy S, S2, S3, S4. Transmission range: 87.0 - 108.5MHz (interval 0.1MHz). Compatible models Sony Ericsson. With A2DP function, stream music from Bluetooth device to car’s FM stereo system. Bluetooth version: JL IC V2.1. Bluetooth Protocol:AVRCP,HFP,A2DP. 1 x Bluetooth device. Music Format: mp3,WMA. Support USB Disk/Micro SD Card. Esolom Bluetooth FM transmitter transmits music from your Bluetooth-enabled audio devices to any car stereo system. 1×Esolom Bluetooth FM Transmitter. Bluetooth Version: 4.2. ◆Supports music playing from USB Flash Drive. Mini Bluetooth Audio Receiver Bluetooth Transmitter 3.5mm Jack Handsfree Bluetooth Car Kit Music Adapter Bluetooth Car AUX. This Bluetooth Receiver enables wireless listening to any Bluetooth enabled device. TeckNet Bluetooth FM Transmitter F36: Enjoy your portable music collection while you drive with the TeckNet F36 FM transmitter. Great value, easy to install and featuring a USB port, this handy bit of kit will also charge your device while you are driving. ---Built-in FM transmitter, frequency range is between 87.5-108.0MHz. --- ---DC 5V/2.1A USB port for charging iPods, iPhones and other mobile devices. ---Durable and elegant design with LED alphanumeric display. ---Bluetooth version: V4.0, support A2DP function ---Frequency range: 87.5-108.0MHz ---Frequency stability: ±10ppml ---Power input: 12-24V ---Charger output: 5V/2.1A Specification: Bluetooth Version: V4.0, support A2DP function Effective Bluetooth Range: 10 meters FM Frequency: 87.5MHz - 108. Adapting professional high performance bluetooth module, make it capable of playing the music files in usb drive, firing into the car stereo via wireless fm. Besides, during the bluetooth connecting, play the phone's music and the fm transmitter to car audio, as the calls incoming switches to the speaker state, when call ends, it will switch back to music playing. 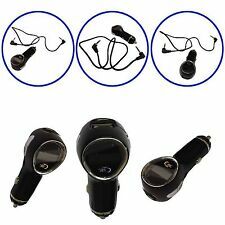 (This item can only be used in cars with an Auxiliary Port (AUX). 3) Plug in AUX cable and adjust the radio mode. Simple Setup: Easy to connect your smartphone with your car stereo - just simply plug it into your car's auxiliary input jack and pair with your phone via Bluetooth; Automatically power on and connect to the last paired device. The Bluetooth receiver uses updated wireless technology to adapt audio systems with Bluetooth capability. transfer high quality audio that you can enjoy a crystal clear sound. - BLUETOOTH FUNCTION : Bluetooth V4.0 ,Transfer Calling/ Music/ FM/. VicTsing Bluetooth FM Transmitter for Car, 1.8” Color Screen Wireless Bluetooth Transmitter with Hand-Free Calling, 3 USB Ports, Music Player Support USB Flash Drive, TF Card, AUX Input, Power Off 1.1.8” Large TFT Color Screen. Designed for brighter and clearer display, 1.8” color screen offers you a much wider viewing for incoming phone number, song name, FM frequency, connected Bluetooth device and more. 360-degree rotatable metal hose is highly flexible to adjust for comfortable viewing..
Bluetooth Car MP3 Player Car Dual USB FM Transmitter Car adapter SD/TF. 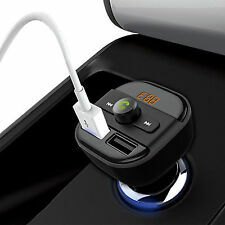 Hand Free Bluetooth Auto KFZ Adapter Radio Transmitter USB MP3 Player Karte Slot. 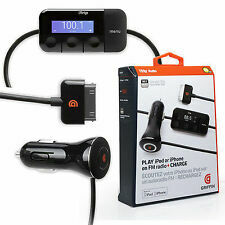 auto car FM transmitter handsfree Bluetooth MP3 Player USB fast charging. 1, FM transmitter. 8, Bluetooth stereo music player. 3, independent Bluetooth startup / shutdown button. 7, using Bluetooth to answer / end / reject / resend. 4, car USB: you can read through the USB interface of the U disk, or read TF card slot. Since the TeckNet doesn't require you to make any permanent connections in your car, it's easy to swap between vehicles. 1x F27 FM Transmitter. Listen to your music collection in your smartphone or MP3 player through your car’s stereo system to enjoy your favourite tunes on the go. You can send DAB / DAB digital radio with Auto system with a simple AUX-IN cable or via FM (RDS). - Install the DAB / DAB antenna, find the correct position, fix the film vertically, stick it to the windshield, then gently press until the film is firmly attached. From Roav - Making the smart driving experience accessible to all. 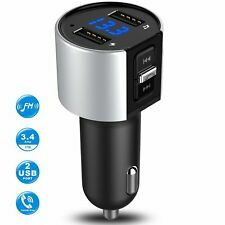 Bluetooth FM Transmitter with 2 USB Charging Ports. Stable Transmission: Solid Bluetooth and FM connections stream music straight from your phone to your car's sound system. Stable Transmission: Solid Bluetooth and FM connections stream music straight from your phone to your car's sound system. Better Hands-Free Calling: Bluetooth 4.2 provides a stable connection and echo-cancellation reduces background noise for clearer calls. 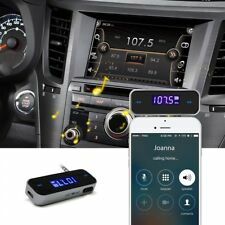 1 x Magnet Bluetooth FM car kit. Bluetooth Version: Bluetooth 4.0 EDR, Class 2. Bluetooth Profiles: AVRCP, A2DP, HFP, HSP. USB Output: 5V / 1A, 5V / 2A. 1 x User manual. Color: Black. Usage: After the FM transmitter was set into bluetooth mode, open the bluetooth of your phone and search "car kit", then clike "match". After your phone is successfully connected to the FM transmitter, you may enjoy wireless music and hands-free call. AUX Input and output function;. 1 x Bluetooth Car MP3 Player. FM Frequency range: 87.5MHz to 108MHz. Bluetooth transmission distance: 10M. FM transmission frequency: 87.5-108Mhz. Support Play format: MP3 / WMA. Built in speaker and microphone;. - To make/answer/end/reject/redial a call by the bluetooth speakerphone. - 1 x Bluetooth Handsfree Speakerphone. - Allows a speakerphone connecting to your phones. Handsfree Call---FM Transmitter adapter built-in microphone with CVC noise reduction and echo cancellation technologies achieve high quality calls.Freely convertible between hands-free call and music playing. FM Transmitter Aux Modulator Bluetooth Handsfree Car Kit Audio MP3 Player. Wireless FM Transmitter Modulator Bluetooth Car MP3 Player USB Car SD. 3.1A Bluetooth AUX Car DAB Radio Receiver LCD Screen FM Transmitter Car. This BLUETOOTH music receiver can be used with almost any audio receiver with an audio input jack, including automoblies. This item can only be used in cars with an Auxiliary Port (AUX). - Supports all with AUX input of the car stereo! Bluetooth Handsfree Car Kit FM Transmitter Modulator Aux Audio USB MP3 Player. AUX Input and output function;. 1 x Bluetooth Car MP3 Player. FM Frequency range: 87.5MHz to 108MHz. Bluetooth transmission distance: 10M. 3.5mm FM Radio Music Transmitter Car Player. Apple iPhone, iPod, iPad, Samsung, HTC, Sony, LG, Blackberry, Motorola, MP3, MP4, Tablet PC and all devices with 3.5mm headphone socket. 1 x 3.5mm FM transmitter. Does not help anyone. We assure you that we will try our best to satiate your needs and resolve issues. Since all are busy, in place of ?. to redress your grievances. We generally solicit your whole hearted support in this endeavour. Click here to learn more about the product: Features 1.1.44 inches LargeScreen can show incoming call number, voltage level in car battery, volume, FM frequency and song name if you play music from TF card or USB flash disk. Easy to read at night and in the day. 2.Four Playing Modes. A: Play music from Bluetooth-enabled devices via FM signal; B: stream music from TF card, supporting music files like MP3, WMA, WAV; C: transmit music from USB flash disk; D : stream music from your MP3 player, old speaker, tablet etc to the car stereo system via 3.5mm audio cable. 3.Dual USB ChargingStations. Charge two devices simultaneously. Max current output: 2.1A, provide fast charging speed.. Features: Support connecting two mobiles at the same time, support A2DP function. Adopting latest Bluetooth V 4. This is a wireless car fm transmitter radio adapter and it is compatible with bluetooth enabled devices, like iPhone, iPad, iPod, Tablet, Smartphones or MP3, MP4 Players. Adopted advanced interference and noise cancellation technology - CVC technology creates full duplex sound and suppresses noise. 3.5mm FM Radio Music Transmitter Car Player. 1 x 3.5mm FM transmitter. Apple iPhone, iPod, iPad, Samsung, HTC, Sony, LG, Blackberry, Motorola, MP3, MP4, Tablet PC and all devices with 3.5mm headphone socket. 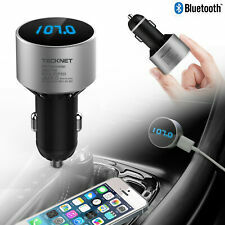 Wireless Bluetooth Handsfree Car Kit FM Transmitter MP3 Player Dual USB Charger. An in car FM transmitter plugs into the cigarette lighter in your car to play your favourite audio from your smartphone through your car's speakers. Some models even allow you to receive calls through your car stereo, allowing you to connect with friends and family hands free. Whatever your needs and budget, there is sure to be an in car FM transmitter for you on eBay. What should you look out for when choosing an in car FM transmitter? Bluetooth connectivity: Connects your phone wirelessly so that you can play your favourite audio through your car stereo without cables. USB ports: Devices can come with a number of USB ports that allow you to charge your devices when your car engine is running. Built in microphone: To receive calls when driving, the audio is played through your stereo whilst the caller can hear you thanks to the built in microphone. Control buttons: Some devices have one touch buttons to help you control your audio or answer calls. Monitor car battery: Some devices can detect the performance of your car battery and offer you a warning if it gets low. How should an in car FM transmitter be set up? Setting up an in car FM transmitter is relatively easy. Transmitters basically convert your audio into an FM signal that can be picked up by the stereo in your car. To set up a new transmitter simply plug the device into your cigarette lighter or another power source. Play some audio through the device so that you can determine when set up is complete, and then search for an unused FM frequency on your car radio. The manufacturer might recommend that you use frequencies within a particular range, so stick within that if possible. Once you have found an unused frequency, program your device into the same one, and you should be good to go. You won't need to go through this process every time as the chosen frequency can be installed as a pre set on your radio. Can you see information about what audio is playing? Some in car FM transmitters have a large screen and will display information about what audio is playing. Alternatively, your car stereo might be able to display text information about what you are listening to and if you connect your phone via Bluetooth, your transmitter will send this information for you.